Ghanbari, Javid, Golabchi, Mahmoud, Bemanian, Mohammad Reza, Pourmand, Hasanali. (1393). The Accordance of Vernacular Earth Architecture with IEPs and the Natural Image of Sustainability: Investigation of Earth Architecture of Kavir. معماری و شهرسازی آرمان شهر, 7(12), 31-39. Javid Ghanbari; Mahmoud Golabchi; Mohammad Reza Bemanian; Hasanali Pourmand. "The Accordance of Vernacular Earth Architecture with IEPs and the Natural Image of Sustainability: Investigation of Earth Architecture of Kavir". معماری و شهرسازی آرمان شهر, 7, 12, 1393, 31-39. Ghanbari, Javid, Golabchi, Mahmoud, Bemanian, Mohammad Reza, Pourmand, Hasanali. (1393). 'The Accordance of Vernacular Earth Architecture with IEPs and the Natural Image of Sustainability: Investigation of Earth Architecture of Kavir', معماری و شهرسازی آرمان شهر, 7(12), pp. 31-39. Ghanbari, Javid, Golabchi, Mahmoud, Bemanian, Mohammad Reza, Pourmand, Hasanali. The Accordance of Vernacular Earth Architecture with IEPs and the Natural Image of Sustainability: Investigation of Earth Architecture of Kavir. معماری و شهرسازی آرمان شهر, 1393; 7(12): 31-39. 1Ph.D Graduate, Faculty of Art and Architecture, Tarbiat Modares University, Tehran, Iran. 2Full Professor, Faculty of Fine Arts, University of Tehran, Tehran, Iran. 3Full Professor, Faculty of Art and Architecture, Tarbiat Modares University, Tehran, Iran. 4Assistant Professor, Faculty of Art and Architecture, Tarbiat Modares University, Tehran, Iran. Abaft Yegane, M. (2007). Designing the Center for Kavir Studies, TarbiatModares University M.A. Thesis in architecture, Tehran, Iran. Burnett J. (2007). City Building-echo-labels and Shades of Green, Landscape and Urban Planning, 81-93. Cambridge International Dictionary of English, (1995). Cambridge, Cambridge University Press. Coetzee, Jan K. et al. (eds.). (2001). Development Theory, Policy and Practice Cape Town, Oxford University Press Southern Africa. Dehkhoda Persian Encyclopedia. Elizabeth, L. & Adams, C. (Eds) (2005). Alternative Construction: Contemporary Natural Building Methods, Published By John Wiley & Sons Inc, London & NY. Ghobadian V. (1996). Analyzing Iran’s Traditional Structures from a Climatic Perspective, Tehran University Press, Tehran, Iran. Hashemian, L. (2004). Designing Kaviri Garden (With Emphasis on Natural-Environmental Factors), Tarbiat Modares University M.A thesis, Tehran,Iran. Kasmae M. (1993). Climate Zoning in Iran, Housing and Residential Environments, Building and Housing Research Centre, Tehran, Iran. Mortada, H. (2003). Traditional Islamic Principles of Built Environment, New York: Rutledge Curzon. Naghizadeh, M. (2002). Cultural Fundamentals of Iranian Sustainable Architecture, Journal of Maskan-o-Enghelab (Housing & Islamic Revolution), Vol.100, 32-49. Naghizadeh, M. (2003). Characteristics of Water in Iranian Culture and Its Effect on Shaping the Living Environment, Journal of Environmental Studies 32 (4), University of Tehran, 71-92. Plessis Chrisna du (ed.). (2002). Agenda 21 for Sustainable Construction in Developing Countries, Pretoria, CSIR Building and Construction Technology. Radmand, D. (1999). Islamic Thought in the Studies of Sustainable Development Preserving the Environment, The First Conference of “Islam And The Environment”, Tehran, Iran, 65-77. Shafiei Mazandarani, M. (1999). The Effect of the Environment on Human Bing from Islam Viewpoint, The first conference of “Islam and the Environment”, Tehran, Iran, 137-141. Tavassoli, M. (1979). Urban Structure and Architecture in the Hot-Arid Zone of Iran, Roshdieh Publishing, Third Edition, Tehran, Iran. Tehrani, F. (1998). The Role of Earth in the Vernacular Architecture of Central Iran Plateau, Traditional Structures Series of Papers, Center for National Architectural Documents, ShahidBeheshti University, Tehran, Iran. The Holy QUR’AN. Williamson, T., Radford, & A. Bennetts, H. (2003). Understanding Sustainable Architecture, London, England, 27-29. Ziari, K. (2000). 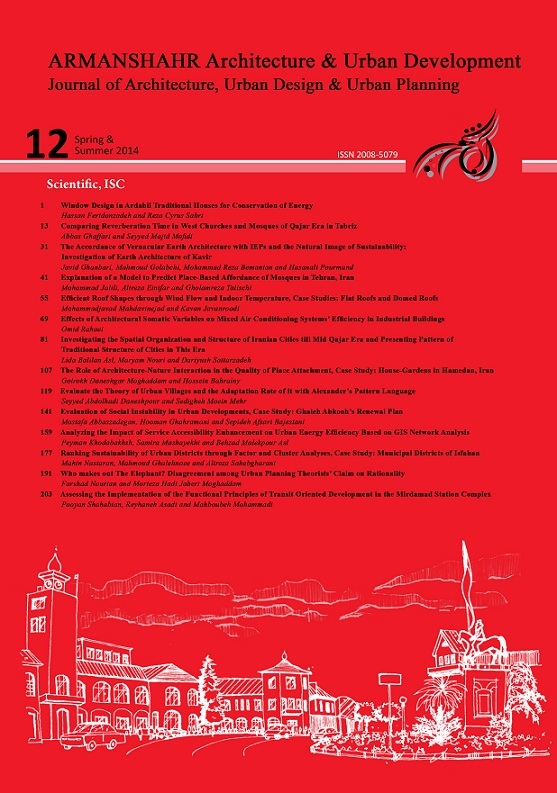 Qanat Technique In Iran And Its Role In The Initial Shaping Of Iran Settlements, SID Documentation Center, Journal of Technical Sciences, Vol. 28, 81-90.